Festive books guaranteed to fill you with the joys of the season. Christmas is just around the corner, but if you’re still feeling those winter blues and haven’t quite mustered up the energy to get excited yet, we’ve created a list of festive books sure to get you into the Yuletide spirit. In the snow-topped mountains of the Canadian Rockies, Meg and Mitch are living their dream, until tragedy strikes in the form of a polar storm. Meg desperately tries to radio for help - and it comes from the most unexpected quarter, a lone voice across the airwaves. A gripping, festive novel from Karen Swan,bestselling author of Christmas in the Snow. This gripping psychological thriller is the story of a woman on the run with her daughter, her identity hidden and their destination unknown to the family they've left behind. When they find a grand old empty house they think they've found a place where they can live in solitude. But they're not alone. The Costwolds' town of Stourton-on-the-Hill has its very own cat café where resident cat Molly, and her kittens, live in feline paradise, but things can’t always go to plan. More charming cat capers from the author of Molly and the Cat Café. It's Christmas Eve 1920 when nine-year-old Abby Kirby's family is ripped apart by a terrible tragedy. A heart-warming story of triumph over adversity by Rita Bradshaw, author of the number one bestselling Dancing in the Moonlight. 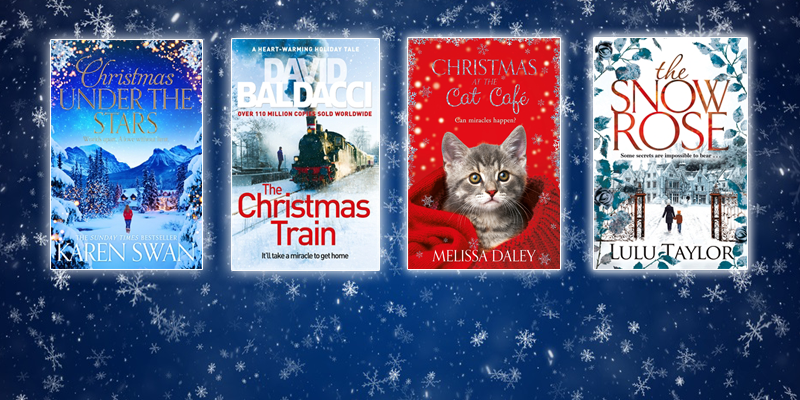 The Christmas Train by David Baldacci follows disillusion journalist Tom Langdon trying to get to from Washington to LA in time for Christmas. Equal parts hilarious, poignant, suspenseful and thrilling; The Christmas Train contains screwball escapades and holiday magic aplenty. A delightfully warming collection of short stories by authors including Margaret Dickinson and Rita Bradshaw – also featuring delicious Christmas recipes recommended by the authors as well as extracts from much-loved saga novels. A real Christmas treat. Inspired by the medieval tradition of appointing a Lord of Misrule, Carol Ann Duffy's warm and enchanting Christmas poem takes us into a topsy-turvy world of festivity and celebration, where rules no longer apply. Lara Hawthorne's beautiful illustrations make The King of Christmas the perfect gift for poetry lovers. Follow Evie Flynn as she tries to spread Christmas cheer against the odds in this enchanting and engrossing festive short story from Lucy Diamond. Perfect for fans of Philippa Gregory and Elizabeth Chadwick, The Christmas Court tells the tale of King Edward's royal court gathered at Westminster to welcome William of Normandy to England. But intrigue follows when it is revealed William has an ulterior motive for making his timely visit to his childless royal cousin. Whilst planning a Christmas Eve wedding on the Scottish isle of Auchenmor Kate battles a mismatched bride and groom and a hysterical PR. Escape the stresses of the Christmas season with this warm, funny and light-hearted novella from bestselling author Rachael Lucas. The ultimate feel-good Christmas classic. Charles Dickens' tale of the miserly, penny-pinching Ebenezer Scrooge who views the season for giving as 'humbug' is still a relevant and well-loved cautionary tale against greed over a century after it was originally written.